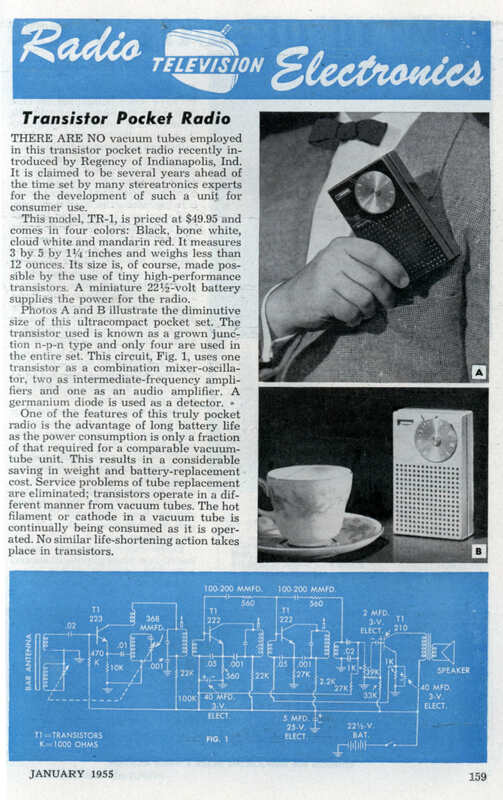 THERE ARE NO vacuum tubes employed in this transistor pocket radio recently introduced by Regency of Indianapolis, Ind. 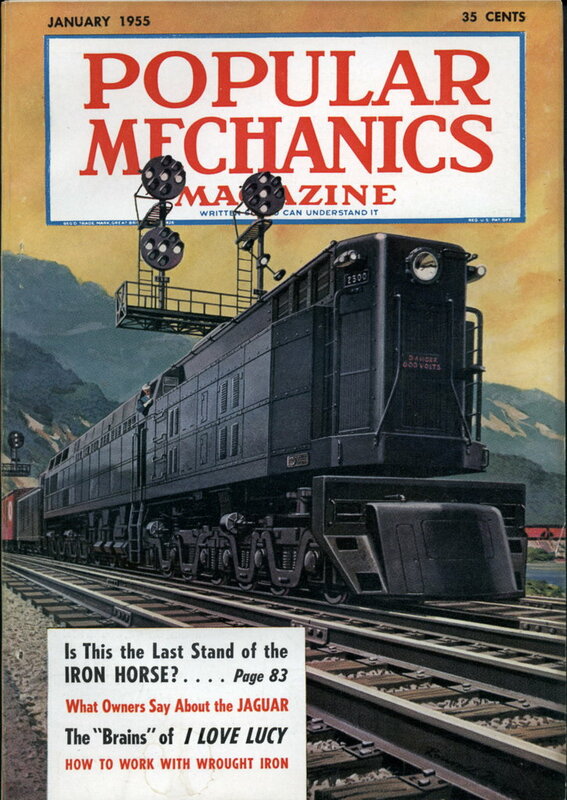 It is claimed to be several years ahead of the time set by many stereatronics experts for the development of such a unit for consumer use. This model, TR-l, is priced at $49.95 and comes in four colors: Black, bone white, cloud white and mandarin red. It measures 3 by 5 by 1.25 inches and weighs less than 12 ounces. Its size is, of course, made possible by the use of tiny high-performance transistors. A miniature 22.5-volt battery supplies the power for the radio. Photos A and B illustrate the diminutive size of this ultra compact pocket set. The transistor used is known as a grown junction n-p-n type and only four are used in the entire set. This circuit, Fig. 1, uses one transistor as a combination mixer-oscillator, two as intermediate-frequency amplifiers and one as an audio amplifier. A germanium diode is used as a detector. One of the features of this truly pocket radio is the advantage of long battery life as the power consumption is only a fraction of that required for a comparable vacuum tube unit. This results in a considerable saving in weight and battery-replacement cost. Service problems of tube replacement are eliminated; transistors operate in a different manner from vacuum tubes. The hot filament or cathode in a vacuum tube is continually being consumed as it is operated. No similar life-shortening action takes place in transistors.